Today I am thankful for witnessing the most awkward, fish-out-of-water weekend getaway in the history of Bravo. I was hoping for a Real Housewives of New Jersey crossover with Sweet Home. All I got was the preemptive simmer of a Teresa Giudice/Melissa Gorga meltdown. However, I am so grateful for last night’s RHONJ episode, and all the wind that wound their weaves. Happy Thanksgiving, y’all! The ladies are prepping for their southern safari with the requisite amount of leopard print and rhinestones. Margaret Josephs is thrilled to work on her Hospital Heroes children’s hospital gown line with her longtime friend Polly. Teresa calls her brother Joe Gorga asks him to spend time with the amazing Giacinto Gorga, aka Nonno, while she and Melissa are out of town. Joe is frustrated with his sister’s directives. He’s far too busy with work. He urges a reluctant Melissa to go stand up to Tre in his absence. She doesn’t want to get in between the siblings. She’s been there, done that, bought the t-shirt, and has the stripper rumors to boot! Upon arrival, the ladies are misusing “y’all”, creeping with hair extensions galore, and enjoying the charming, rustic accommodations. Melissa can smell Teresa’s passive aggression from a mile away. She’s concerned that this trip is going to make her Teresa’s target in lieu of Joe. The women fight over bedrooms and the coyote camper. At least Margaret and Dolores Catania’s friendship gets cemented by Dolores’ ability to be low maintenance. The women unpack after Teresa confuses cow’s milk with sperm. In the camper, Teresa unloads her family drama on Dolores. Melissa does the same with Jackie Goldschneider. Teresa believes Melissa holds all of the power when it comes to convincing Joe to hang out with his dad. The women convene for dinner. Jennifer Aydin is obsessed with Chanel while the others opt for Jersey’s version of lumberjack chic. Margaret quickly grows tired of Jennifer one-upping Polly’s digs. Over cocktails, Margaret explains Danielle Staub’s absence as Teresa preps her bikini competition meal. This prompts Jackie to share her story of struggling with anorexia. She explains that her rock bottom occurred when she started weighing her children’s food portions in addition to her own. Melissa feels inspired to share her own personal story. She tells the group about trying to reach her deceased father through a psychic. The medium told her she had a sister she didn’t know about. Melissa recalls her dad’s promiscuous past and a strange woman sobbing at her father’s funeral. They must be connected! As Melissa cries, Teresa seethes. How cold she is to be so torn up about a psychic’s tale instead of her father-in-law who desperately needs time with his son! The following morning, the women are awakened by the moos of a local cow. Teresa heads out for a run while Margaret helms breakfast. Melissa Facetimes Joe about her maybe-sister. Teresa checks in with her father and the girls. She learns that Joe and Nonno have plans to go to dinner. Teresa deduces that Melissa must be the problem if Joe will hang with dad when she’s out of town. She brings this up over their morning meal. When Melissa bristles at this realization, Dolores steps in to back Teresa. Tre reminds Melissa that she and Joe vacationed on the one year anniversary of Joe’s mom’s death. 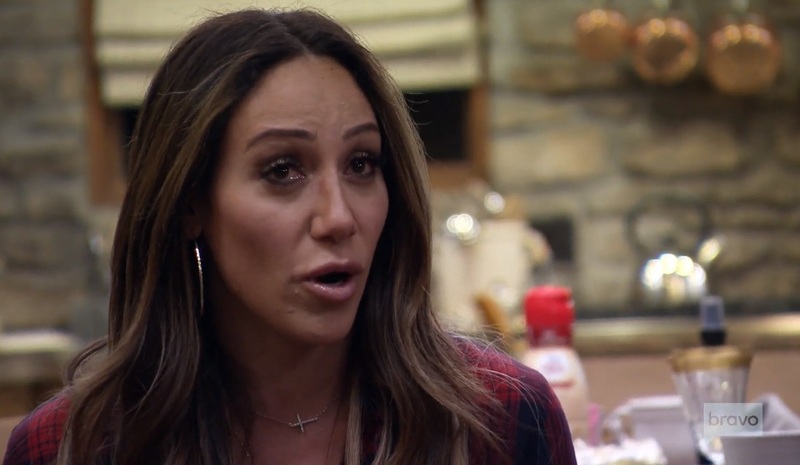 Melissa retorts that Teresa has too much time on her hands with Joe Giudice in jail. They break into an argument over whether wives can control their husbands. In case you missed it, Melissa can’t control her Joe, but Tre can control her Joe…except for all that fraud stuff. The newbies are in shock over this conversation, but Margaret and Dolores try to pacify the situation. Teresa stomps off in some high-heeled silver cowboy boots. Margaret thinks target practice and fishing lessons are much-needed distractions. Thankfully, Bravo has the foresight to separate Melissa and Teresa during these activities! Margaret channels her fisherman zen with an adorable relative of Polly’s (is that her grandson?). Teresa garners the only catch of the day. Melissa and Jackie freak out during their shooting session. Back home, Joe stresses over his businesses and the household. He says that he always thought Joe Giudice was the cause of the rift between him and his dad. He totally did! I watched the season three RHONJ premiere earlier today and that’s what he said! Now he suspects his sister is at fault. Jennifer tries to align herself with Teresa. Does she want to detract from chatter about her superficiality? Jennifer says it is admirable that Teresa fights for her father’s wishes. Margaret strives to be the voice of reason. She should know better with this group! Even so, she suggests Joe vacationed on his mother’s death anniversary because he needed an escape and couldn’t face the day. Of course, Teresa refuses to believe such “nonsense.” Her brother should have been present for her grieving. The crew, minus Melissa, heads out on the town to shop for Western wear. Teresa knows her sister-in-law is in avoidance mode. She doesn’t appreciate Jackie defending Melissa. Margaret is also spared from the drama because she’s working on Polly with Hospital Heroes. It’s actually a brilliant concept. Their brainstorming makes me want to stroke them a check to make it a reality. Across town, the Jersey contingency considers paying hundreds for some ridiculous boots. Jennifer may love her Chanel, but she’s not about to waste money on this silliness. She’s frugal when a designer label isn’t involved! Margaret pulls Melissa aside to recap the breakfast conversation. She understands Melissa’s frustrations. She also reminds her that Teresa is under a great deal of stress and likely taking additional stuff out on her sister-in-law. Melissa confides in Margaret that she doesn’t feel accepted by Teresa. Margaret urges her to share these feelings. Before dinner, Melissa approaches her sister-in-law to discuss the morning’s heaviness. Then, she asks Teresa if she will ever truly accept her as family. Melissa wonders if Teresa thinks of her as anything more than her brother’s wife. Teresa thinks Melissa’s concerns are ridiculous, but they call somewhat of a truce. Melissa hopes that Teresa will go straight to Joe with her issues. Teresa admits that Melissa better hope she doesn’t share her thoughts with her brother. TELL US – SHOULD TERESA CONFRONT JOE HEAD ON? OR IS MELISSA TO BLAME FOR HIS LACK OF FATHER/SON TIME? ARE YOU TEAM TRE OR TEAM MELISSA? 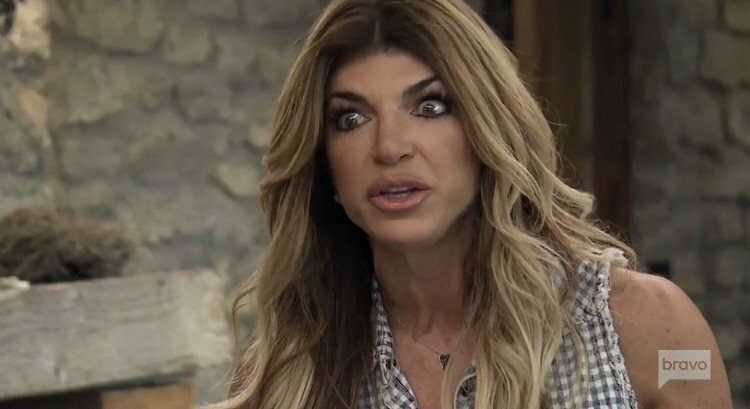 WHAT DO YOU THINK ABOUT REAL HOUSEWIVES OF NEW JERSEY SEASON 9 SO FAR?